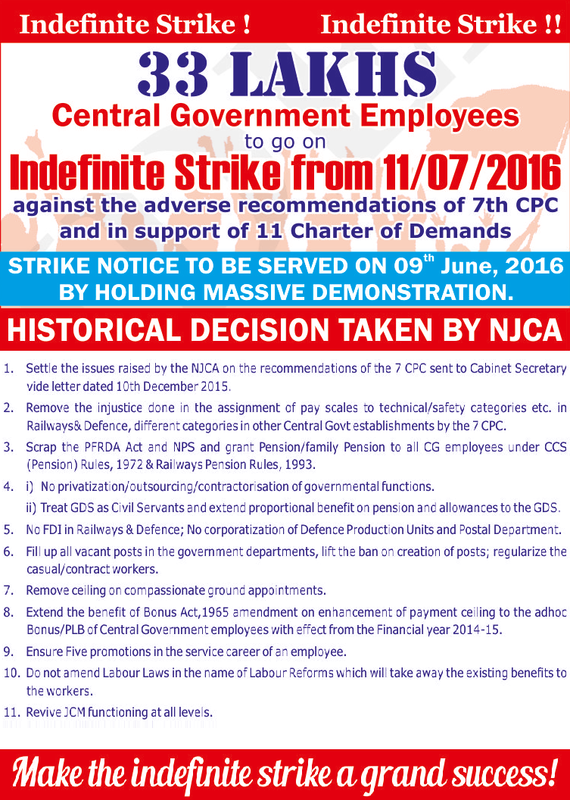 NJCA DECIDED TO SERVE STRIKE NOTICE ON 09.06.2016. Indefinite strike will commence from 11th July 2016. PRECAUTIONS TO BE TAKEN TO PREVENT FRAUDS AFTER IMPLEMENTATION OF CBS. NOW THE BALL IS IN THE GOVT’S COURT, LET US BE READY FOR INDEFINITE STRIKE FROM 11TH JULY 2016. Seventh Central Pay Commission has submitted its recommendations to Government on 19-11-2015. As most of the recommendations are retrograde and far below the expectations of the employees, the JCM National Council Staff side under the united banner of National Joint Council of Action (NJCA) strongly protested and demanded modification of the retrograde recommendations. It further decided to organise indefinite strike and letter conveying the decision was sent to the Cabinet Secretary. Main demands raised by NJCA are: (1) minimum wage of Rs.26,000/- as against 18000 recommended by CPC, (2) upward revision of the fitment formula and application of the same in all pay scales in the pay matrix, (3) retention of percentage of HRA as 30%, 20% and 10% as against 24%, 16% and 8% recommended by CPC. (4) recommendation of the CPC to abolish important allowances should be rejected, (5) reject recommendations to discontinue all non-interest bearing advances, (6) reject the recommendation to reduce the salary to 80% for the second year of child care leave, (7) reject recommendations to impose more stringent conditions on MACP scheme such as “very good” benchmark, qualifying examination, re-introduction of efficiency bar etc. (8) modification in the parity-in-pension and acceptance of other minimum demands of pensioners and (9) Grant of Civil Servants Status to Gramin Dak Sevaks and extending all the benefits of departmental employees to Gramin Dak Sevaks on pro-rata basis. There are other demands also which are equally important. Govt. constituted an Implementation Cell in the Finance Ministry to study the recommendations and submit its proposal to the Empowered Committee of Secretaries under the Chairmanship of Cabinet Secretary. Empowered Committee will submit final concrete proposals to Cabinet for approval. 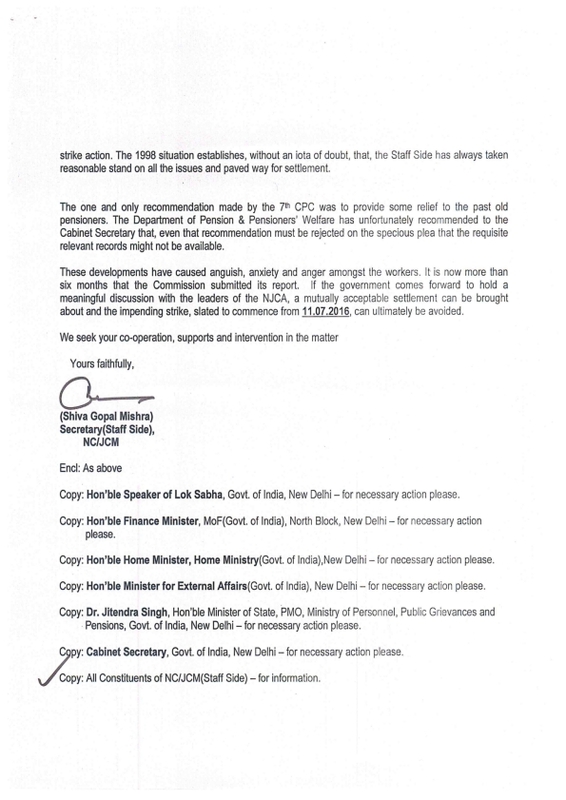 On receipt of the letter of NJCA addresed to Cabinet Secretary regarding indefinite strike, the Implementation Cell called the JCM staff side leaders to present its view points before the cell. Accordingly the NJCA leaders met the Convenor of Implementation Cell and explained the justification of each demands in the charter of demands. NJCA decided to give strike notice on 11th March 2016 to commence the indefinite strike from 11th April 2016. At this stage the Cabinet Secretary invited the JCM National Council staff side leaders for discussion with Empowered Committee of Secretaries on 1st March 2016. The NJCA leaders attended the discussion and once again explained the justification of all demands before the Empowered Committee. Cabinet Secretary gave a patient hearing but made no commitment on any of the demands. He finally appealed the staff side to give some more time for the Government for inter-departmental consultations and to take a final view and decision on ech demand raised by the staff side in the charter of demands. NJCA met and reviewed the whole situation and came to the conclusion that as the Government has appealed for some more time to take a decision, it will be appropriate on the part of the staff side to give time to the Government, so that later on Government cannot blame that NJCA went on sudden strike inspite of the appeal from the Government to give some more time. Secondly, Railways and Defence departments come under the purview of Industrial Dispute Act and as per the ID Act, if strike notice is served on 11th March 2016, strike should commence within six weeks from the date of serving notice, by which time the election in four states will not be over. Thirdly, as the Assembly elections in four states have been notified and election code of conduct has come into force, the employees of four states will find it difficult to join the strike as many of them will be drafted for election duty. Taking into consideration all the above aspects, the NJCA decided to defer the indefinite strike from April 11th to July 11th and to serve the strike notice on June 9th instead of March 11th. Now the ball is in the Govt.’s court. Before June 9th, ie. date of serving strike notice, the Government will be getting seven month time from the date of submission of the 7th CPC report, to take a final decision on all the demands and also to come to a negotiated settlement with the staff side. Any further delay is unwarranted and unjustified and cannot be tolerated. If the Government take an adamant stand and reject the justified demands of the staff side, then we will be forced to serve notice for indefinite strike from July 11th. Government cannot take the staff side for granted. AIPEU Group-C CHQ appeals to all the constituents of NJCA to take a firm stand and not to compromise on minimum demands. 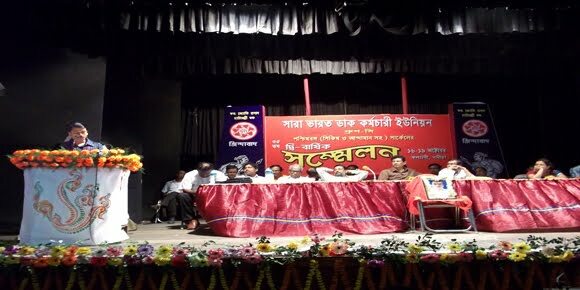 Let us also pledge that we will be second to none, in organising the indefinite strike in Postal and ensure cent per cent participation of our membership at gross root level in the impending strike. Declaration of Assets and Liabilities by Public Servants under section 44 of the Lokpal and Lokayuktas Act, 2013 - Filling of Returns by public servants on or before 15th April, 2016. NO MORE EXTENSION OF DATE FOR THE FILING OF THE SAID RETURN. SO, ALL ARE REQUESTED TO FILE IT WITHIN THE STIPULATED TIME PERIOD. REVISED DOCUMENT SENDING PROCEDURE TO CPC W.E.F.01.04.2016. · All AOF forms, KYC documents (ID proof/ Address proof/Age proof) and any other documents submitted by customer should preserve at SOL level only in date-wise A4 size binders. · Don’t staple the Photograph on KYC Application Form. Please paste the photograph on KYC application form at space provided. · For Joint a/cs don’t use Joint photograph of the customers. Please paste the individual Photographs of the customers against the fields mentioned for Applicant (1) /Applicant (2). · Please mention correct CIF id and Account id / Registration number of certificates against the fields provided in the KYC Application Form. · If any omissions are there in KYC application forms pl return the forms to concerned sub offices for supply of omissions. 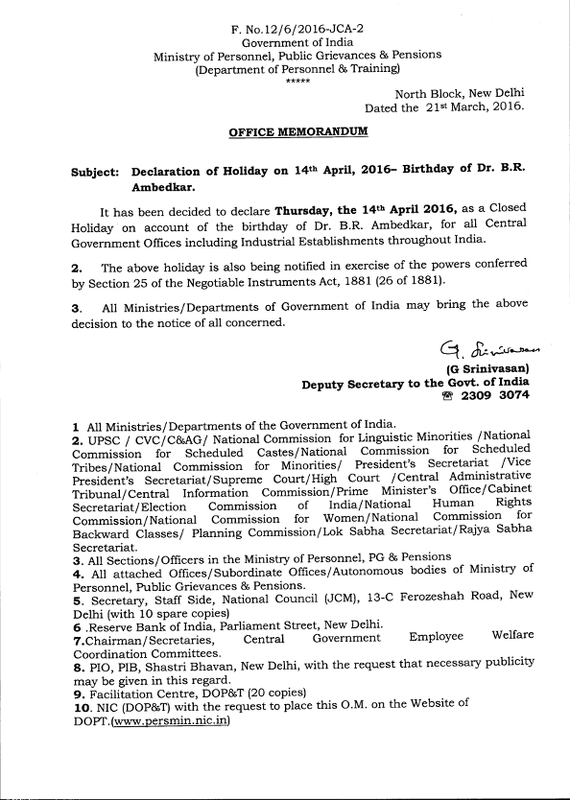 Declaration of Holiday on 14th April, 2016-Birthday of Dr. B. R. Ambedkar. 7th Pay Commission: Minutes of the 2nd meeting of Empowered Committee held with NCJCM Staff Side. CUT IN INTEREST RATE FOR SMALL SAVINGS SCHEMES; NFPE WRITES TO THE HON`BLE MOC. Sub: Cut in interest rate for small savings schemes. 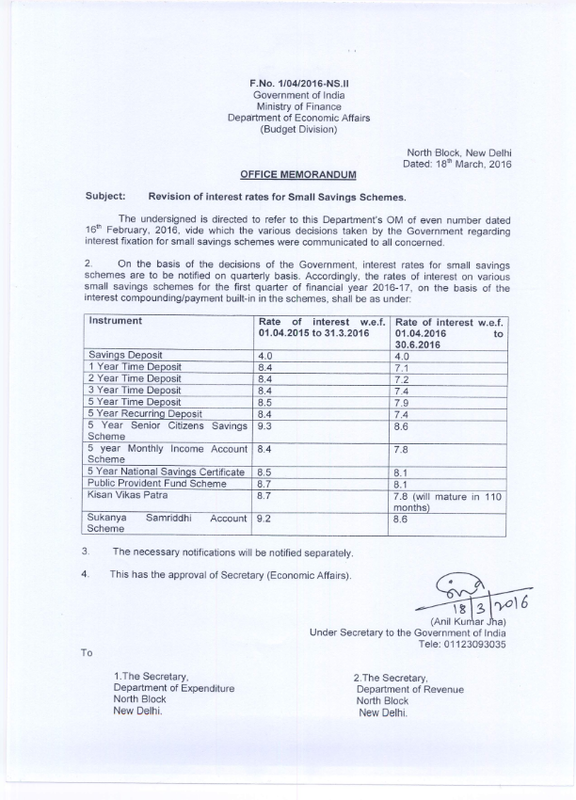 As you are aware that the Government of India, Ministry of Fiancé, Department of Economic Affairs (Budget Division) vide F.No.1/04/2016-NSII dated 18th March -2016 has issued orders to cut the interest rates for Small Savings Schemes which will adversely affect the poor people and customers in Post Offices. 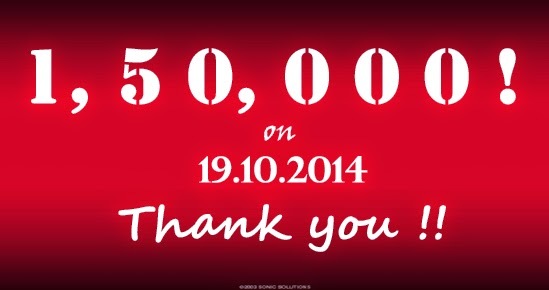 Already due to CBS related problems thousands and thousands customers have closed their accounts in Post Offices. Further this cut in small savings schemes like, NSC, KVP, PPF,MIS, Sr. Citizen Savings Schemes and Sukanya Samriddhi Yojna will force them to invest their money in some other schemes. It is therefore requested to kindly utilize your good office and convince the Finance Ministry to exempt Small Savings Schemes in Post Offices from interest cut to protect interests of common man. A meeting of the NJCA held today with the Convener, Implementation Cell, Ministry of Finance, Shri R.K. Chaturvedi, wherein we discussed and emphasized on all the 26-point Charter of Demands of the NJCA send to the Cabinet Secretary on 10.12.2015. We agitated the issues of NPS, Minimum Wage, Multiplying Factor, deduction of HRA and all other important issues. The Convener, Implementation Cell, Shri Chaturvedi, after hearing everybody, said that, he would put-up the issues to the Cabinet Secretary, and hopefully a meeting of the JCA would be held with the Cabinet Secretary and the Empowered Committee shortly within 15 days. 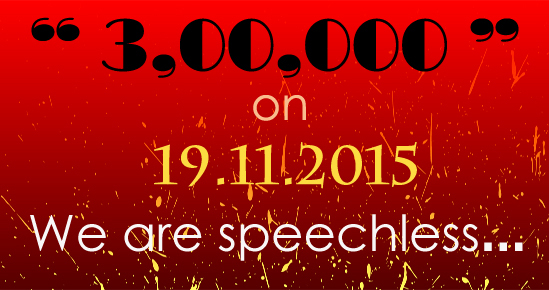 Let us not leave any stone unturned for preparations of the strike. 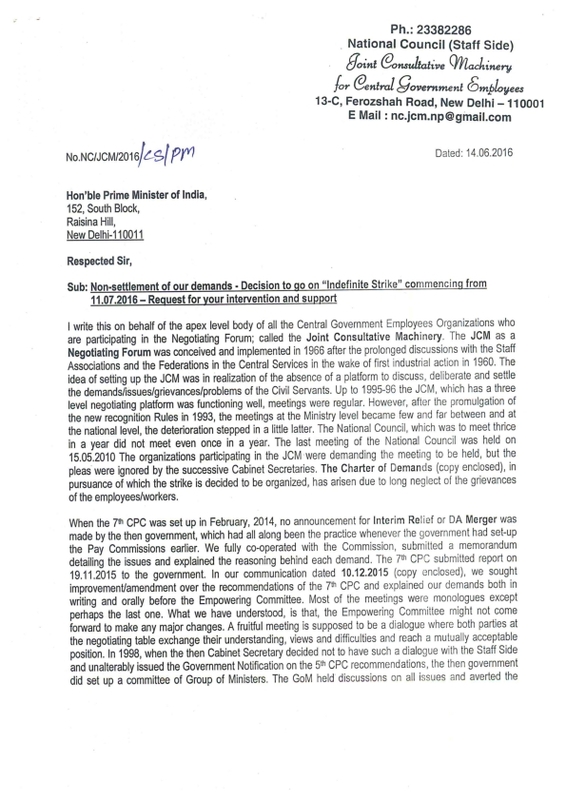 SUPPLEMENTARY LETTER TO THE HON`BLE MINISTER OF COMMUNICATIONS & IT ON CBS/CIS PROBLEMS. Sub: Miseries and untold sufferings faced by the staff in CBS &CIS rolled out offices throughout the nation – Immediate and personal intervention requested to rein in the situation. In continuation of this Federation’s letter of even no. dated 20.1.2016 , we submit the following additional issues for immediate settlement in order to avoid chaos and stalemate in the service in the near future due to the hasty migration of CBS & CIS. (i) Whenever migration takes place, Finacle becomes abnormally slow and every single transactions take too long and the customer at the counter gets irritated and become Quarrelsome. If this lacuna is not rectified at the earliest, it is prone to invite undue displeasure of customers and endanger our customer base. (ii) Similarly ATM transactions are irritating the customers. In many occasions, cash is not dispensed out of APM while transactions occur and amount is debited from their account. Such scenario occurs in other banks ATM also, but reversal transactions are done within a day or two. Whereas in Finacle, it takes weeks together that too, after several mails from R.O. & C.O. (iii) The Finacle software being used in post offices are based on universal banking solutions and not universal Postal solutions. We have not heard about single handed banks, whereas 60% of Post office in India are now functioning in single handed status only. The SPMs of single handed offices have to work is operator ID and then come out. Again he should log on with supervisor ID for a single transaction which not only consumes a lot of time but also irritate the public who are standing in queue. (iv) Some of the office accounts like 339 (used for BOs) and 340 (used for issuing cheques) can be misused to fund any ones account with crores and crores of rupees as there is no maximum ceiling for our SB accounts as one date. 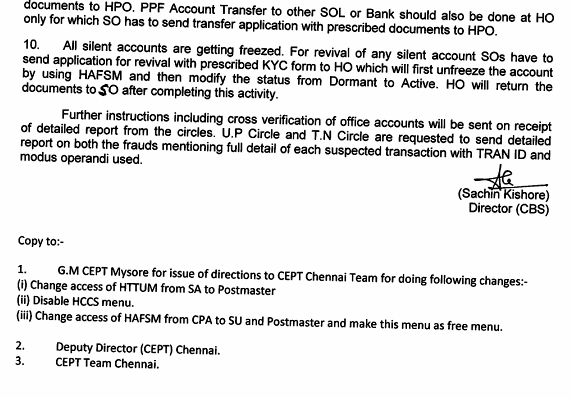 (v) For example, CXFER can be used to fund one’s near and dear accounts in which teller cash will not get raised and simultaneously one can take withdrawals from other SOL (CBS offices) Kashmir to Kannyakumari as there is no cap on other SOL (Service outlet) withdrawal prescribed by the Postal department. (vi) It is opt to bring to your kind notice that some of the banking giants like SBI, ICICI etc. are leveraging services charges for other branch withdrawals and deposits other than through their cash vending machines like ATMs etc. (vii) In the case of single handed offices, both the operator and supervisor remain the same, there are chances of fraud and misappropriation of money and falsification of records. For example, a single handed SPM can take print outs at any point of time and then he can amount the same in his account by using SB CASH and thereafter he can use ‘CXFER’ to fund some one’s account in which teller cash will not get raised. It is not in practice or practicable that the SBCO officials are tallying the Finacle balance of a particular SOL (branch/office) with their S.O. account. (viii) Thereafter, it is suggested that there should be a cap on other SOL withdrawals both in terms of maximum amount and number and customers who wish to use other SOL should be given a SB ID and that request should be given by them at the time of opening the accounts. 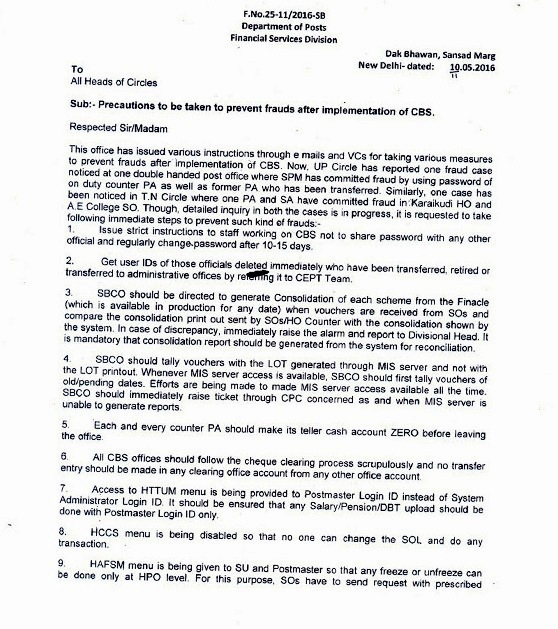 (ix) This is the serious problem which has not been attended so far by the department that most of the deputations to single handed offices are ordered without changing the SOL ID of the deputation incumbent and Single handed SPMs are forced to giver USER ID and Password to the deputed officials in order to avail of their leave, training etc. and also to avoid unnecessary public complaint in their officers which is against the DOPT orders as there is no secrecy in passwords. This issue has not been resolved. There is every chance for the miscreants to misuse the USER ID of other in different computers and defrauding the Government money. At later stage, forgetting the smooth functioning in the absence of no arrangement, the poor innocent official will be proceeded under the contributory negligence factor. This must be set right forthwith. (x) Interest on loan could not be accounted in Finacle Software in the case of loan accounts in which loan amount paid off completely prior to migration period and interest on loan is still pending in the loan account in post migration period. 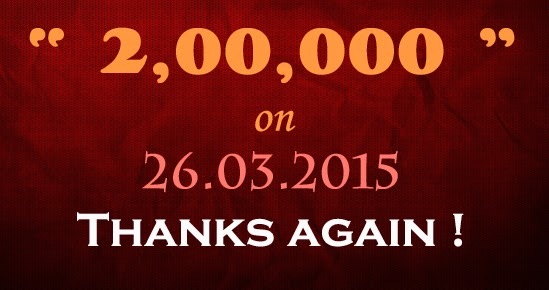 There is scope of defrauding the funds by the fraudulent people by misusing the provision. (xi) In short the Postal Department is working for the vendors and not for its own. Despite ‘Sifi’ has not provided the required speed and service deteriorated, there is no penal action taken against them and the staff alone is being harassed. Some of the issues like SSA LOT are not coming in HFINRPT menu i.e the report menu and the staff are using indirect methods to get the LOT and till now the Department has not taken any efforts to get the work done from our vendor. The need for torturing the Postal officials for the benefits of vendors is best known to the Postal Department. The above are only the tips of ice berg. There are many more issues confronting the service and customers, have not been solved so far. The twenty issues which requires urgent attention in our earlier letter, have not yet been addressed by the Department. Whereas it is extending the migration of offices without providing necessary bandwidth, Computer peripheral etc. unless necessary peripherals are supplied and available, how can it be implanted smoothly in the Postal Department. We request the Hon’ble Minister once again to intervene in this regard. Further we are submitting below the problems being faced at Post offices after the migration and the solution also in a table for the immediate action by the Hon’ble Minister of communication by directly to department to settle all these issues as if fire at the top of the roof. Most of the time due to frequent disconnection of Internet connectivity and during the delayed process in SERVER these two issues are being faced. 2. Though there cannot be any compromise on security the unlocking facility to be given to Divisional level SPOC and System Admin. There is no provision till date to view or print SSA LOT. At present we use HFTI menu (using Sub ledger 30042) to print a list of particulars of transactions alone without any Total. 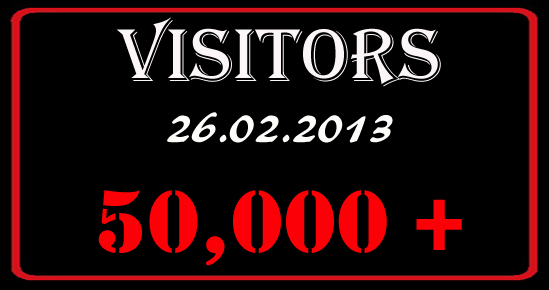 Users physically arrive the Total with ref to vouchers. Menu for SSA LOT is needed. 1. Production Server and MIS Server. Production Server is one where the daily day transactions are stored and where the LOT for the current day alone can be taken. 2. MIS Server is utilized for taking all reports for the older period other than the current day. Maintenance of MIS server with the current BOD. The training server should be reset with current date by deleting all older data that have been stored over two years. The issues faced like network down, Modem Failure, Tower issues, we used to call Toll Free number. Now the same cannot be used as the AGREEMENT Period is over. In case of any issues with sify we have to send a email/lodge a complaint in SIFY PORTAL which may not be possible as network is down. Requested to restore TOLL FREE NUMBERS. During the initial period the important locations (WEGs) where monitored by SIFY. In case of any downs in primary (BSNL) or secondary (sify)link SUO MOTTO action was taken by sify . SIFY should monitor the functioning / Down condition of sites and should take SUO MOTTO action. The minimum bandwidth is 128kbps (NSP II) and maximum is 256 kbps for C and B class offices. 256 and 512 for other class other than HOs . Except HOs all other smaller units are suffering due to low bandwidth. To be enhanced to 512 at C and B class level. To be enhanced up to 1 MBPS for units for rest of the units other than HPOs. Supply of BIO METRIC devices. Past premium postings introduced in Mc Camish. accept premiums and there is large no. of non migration exists. No cutoff date should be fixed, till 100% migration of NIC data to 'CIS' is confirmed. Migrations were made in a hasty manner, to satisfy the higher officers, resulting in heavy non postings. Further, BOs are permitted to accept premiums anywhere, which could not be posted again, if cutoff date is fixed. Despite of these, if cutoff date is fixed, responsibility will be fixed on poor ground level officials for wrong/ short payments. Once again we request your honour to kindly intervene and save the Postal service by stopping the speedy migration. We are not against modernization. CBS & CIS we are praying that all the loopholes, problems in the existing software be rectified and let it be user friendly before the expansion of CBS. All the issues narrated above may please be considered and attended. 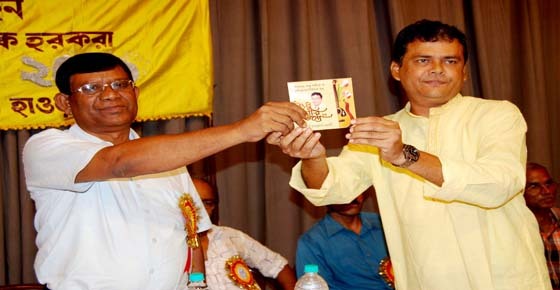 Copy to: The Secretary (Posts) Dak Bhawan, New Delhi Secretary General.